It’s a season of change at TriMet, specifically for our bus fleet. Since 2012, 125 new buses have joined our fleet with 90 additional new buses slated to be in service by year-end. In less than a month, the first of our new 3200 series buses will begin shepherding riders around the region. This past week, the first three buses rolled off the Gillig assembly line in California. In addition to rider and operator amenities, all of our new buses run cleaner, more fuel efficient and mean a more reliable transit trip for our customers. Their innovative cooling system has improved fuel economy by 5-10 percent and the new diesel engines have reduced emissions, minimizing exhaust pollutants. These new cleaner-running buses are replacing some of the oldest in the fleet. 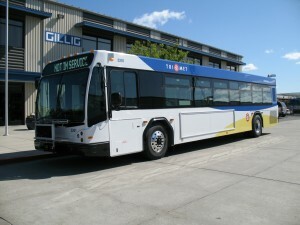 TriMet is in the process of reducing the age of our bus fleet and by 2016 the average age of our fleet will be the industry recommended standard of eight years. With new buses rolling in, our older buses are being retired and recycled. Periodically, TriMet auctions batches of retired buses to local scrap metal recyclers. The buses are auctioned off by weight and typically fetch between $3,800 and $4,250 per vehicle. Prior to final sale, TriMet removes all reusable materials including bicycle racks, fareboxes and fire extinguishers, and requires that all wheels and tires be returned to the agency. The non-metal waste materials are made up of insulation, hazardous materials and plastics that cannot be recycled. The recycling process begins with the bus being weighed. Vehicle fluids, including oil, refrigerants, transmission fluid, lubricants and antifreeze, are drained. The final remaining hazardous materials such as the battery and mercury switch are removed and then the bus is shredded. The recycler then sorts the metals by type and grade. Materials are baled, sheared and finally shipped to mills and refineries for processing. This recycling process reduces the amount of new raw materials needed for manufacturing. It also saves energy and helps protect our natural resources. According to research conducted by the U.S. Environmental Protection Agency, using recycled scrap metal in place of new iron ore can result in roughly a 75 percent energy savings. R.S. Davis Recycling specializes in scrap metal, recycling ferrous metals (tin, steel, iron and vehicles) and non-ferrous metals (copper, aluminum, brass and stainless steel). This keeps a majority of metals out of our local landfills.